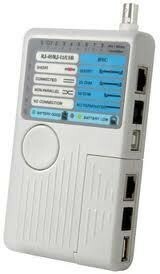 • Can test RJ11/RJ45/USB/BNC cables. • Fast speed in testing. • Straight or crossover indication. • Battery good or Battery low indication. • Can test from two remote points. • 9V Alkaline battery powered. • Plam size carrying bag. • Terminator 25 Ohm / 50 Ohm..indications. • Battery good or Battery low indication . • RJ11 / with RJ45 are equipped with 50u" gold plating. • Fast reaction during test process. • Max. cable length: 300 ft.
• Open / short wire testing.